In the musical Hamilton, near the end of Alexander Hamilton's life, he asks this question: "Legacy, what is a legacy? It's planting seeds in a garden you never get to see." That definition of legacy continues to resonate with me, especially in light of the Arrow premiere. What is a legacy, really? It's you, doing whatever is necessary, to plant things you hope will grow — to sow seeds that you dream will one day turn into trees and plants. You, as a person, invest in people and relationships and make decisions that will affect people long after you're gone. That is what a legacy is — this bittersweet notion that you work and toil on earth and that someday, long after your gone, there will be a garden there but that you won't be around to see it. You can pray and you can hope that your life makes a difference. But you will never know, really, your legacy until you're gone. And by then, it's too late. So why the focus on legacy, here? I talked last year about how Arrow's constant ping-pong match of darkness vs. light, humanity vs. heroism, etc. was growing a bit tiresome. It was the same thing, over and over again. And while this year's theme of legacy might not seem drastically different and may end up veering the same worn course that we're used to seeing with the show (remember how last year was supposed to be about hope and then it suddenly became NOT about that? ), I'm encouraged by the show's direction. Because as we wrap up the flashbacks — we need to have a farewell party to celebrate the end of those — it's going to be more important than ever to see the impact that our characters' pasts have on their present and, more importantly, their futures. 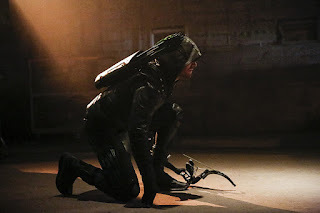 With Laurel dead, Diggle away, and Felicity no longer dating Oliver, a one-man army seems to be Oliver's mission. So let's talk about what "Legacy" established as a new normal, and what it set up for the rest of the season. Okay, I couldn't resist ONE last Damien Darhk pun, now could I? Because even though Darhk is dead, the impact that he had on our heroes is far from buried in a grave. Oliver's team has fractured, as has Quentin's sobriety. I'll spend time talking about these two men and the impact that Laurel's death has directly — or by proxy — had on them. Unfortunately, Quentin Lance is no longer sober when we see him in "Legacy." Nor is he with Donna anymore. No, Quentin has slunk back into a depression, understandably so. And with no one there to bring him back out of it, Quentin has basically given up hope of being anything other than an alcoholic — of being anyone his daughter could be proud of. It's sad, but a lot of addicts feel like this. Heck, a lot of us feel like this sometimes even if we aren't addicts. We take our worst traits and maximize them, then define ourselves by them. Quentin believes that he's an addict and that's all he'll ever be — that happiness and sobriety are distractions from reality. Of course, I don't believe that. And I don't think that deep down, Quentin does either. But it's extremely difficult for you to pull yourself out of the darkness when your rock isn't there to take your hand. And, no matter your personal feelings about her, Laurel Lance was her father's rock. When she died, he spiraled — even more so than when Sara died. Because Quentin and Laurel always understood one another; they were so similar and that's why they often clashed violently but connected deeply. Laurel is gone now, and Quentin spends the beginning of the episode convinced that he is an embarrassment to his daughter's memory. Yet, he shows up at the ceremony unveiling her statue. Why? Because darkness can only win when we refuse to remember what it was like to live in the light. Speaking of living in the light, Oliver's initial run for mayor was supposed to be a platform to do just that — to fight injustice and corruption from a different angle. Except that the only problem is, Oliver isn't doing that (something Thea calls him out on early in the episode). Instead, Oliver has returned to his old habits. Much like Quentin, those are easier and more comforting even if they're damning in the end. Oliver's instincts are always two-fold: to do whatever it takes, no matter the cost; and to go it alone. Laurel's death has taught him surface-level truths which he spits out as mayor: that we're always stronger when we're together, that Black Canary fought for truth and justice, that Laurel was better than he was (okay, technically that one Oliver says in the intro for the episode). The truth is that you can have all of the knowledge in the world, but if you don't apply it, it's useless. Oliver is still stuck in denial throughout most of the episode though, and doesn't want to hear truth. He's like that teenage girl who thinks that her mom is trying to ruin her life when she talks about how the teenager's boyfriend is "bad news." 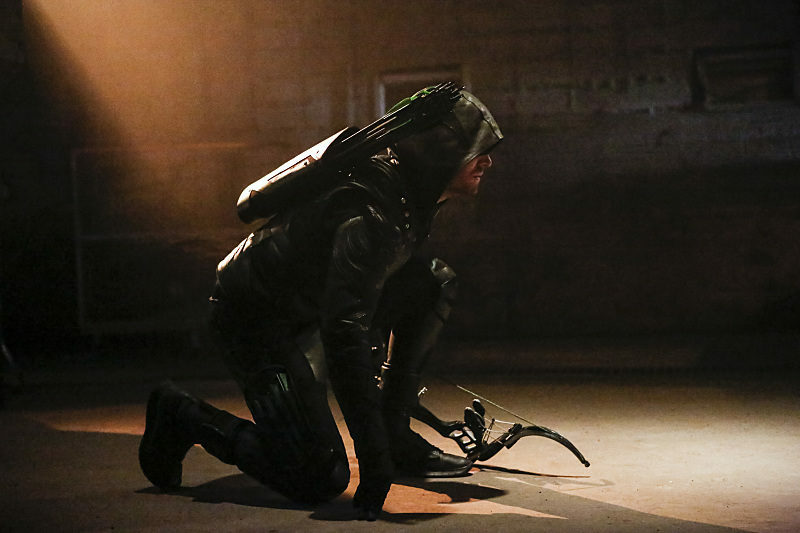 Oliver rebuffs Felicity multiple times throughout the episode, believing that his old team will come back together. If he says it aloud enough, perhaps it will actually become true. But Oliver is hiding — he's hiding behind his fears and his insecurities and he's hiding behind masks, even in the public eye, because he can't deal with the fact that last year he made a decision and his world fell apart. But most of all, he's hiding behind Laurel. He's using her as his shield, as he tries to ward off whatever comes his way. Because it's easier for him to attach to her memory than it is to face the reality of her death. This year, Oliver is going to take a pretty dark road to get to the place where he needs to be as a person. But legacy is the foundation of this character development. It begins in the premiere with him realizing Laurel's legacy, and learning to use it as a catalyst for change, not a prop to lean on. I'm hoping that as Oliver continues to tread down this dark path, and mark my words, it will be dark, that he will eventually find his way back to the light. That is, however, something that only Oliver can do. He's had person upon person pull him out of the pit over the years — Laurel, Tommy, Sara, Diggle, Felicity, Thea, Roy, etc. — and this time, it needs to be Oliver who pulls himself out. That is the only way you can establish a legacy: if it is of your own making, not of someone else's. Arrow had a plethora of strong ladies over the years, and thankfully two remain: Thea and Felicity. Both women in this episode are dealing with Oliver in the best way they know how: by smacking truth into him. Thea keeps telling Oliver that she cannot be in the field anymore; she's finally put aside her bloodlust and is beginning to feel like a human being — not a monster — for once. I honestly could not be prouder of Thea Queen than I was in "Legacy." Here is a woman who loves deeply and will do anything for her brother, but who also knows when she needs to step away and do something for herself. Thea has spent a majority of the past two seasons being the pawn in everyone else's game. Whether Ra's is killing her, Malcolm is controlling her, or Oliver is trying to contain her, Thea has had her strength dampened by the hand of men. But not in "Legacy." Thea has finally come into her own, and is schooling her brother on how to become mayor. I think I've forgotten how intelligent and compassionate Thea is, because we're so used to seeing her run or take a swim in the Lazarus Pit (R.I.P., hot tub of doom). I've forgotten how good and kind and smart she really is. She's keeping the city running, really, and Oliver is just the pretty face with a nice title. But what I really loved about this episode was that Thea stepped back into the hood, only to step away again. She watched her big brother snap someone's neck like it was nothing. And I think that didn't just terrify her for Oliver's sake (his soul is at stake this year, y'all, and his future legacy is too), but for her own. In that moment, Thea saw who she used to be — who she could become again, if she let herself back into the field. There's a conversation prior to this in the episode, in which Quentin convinces Thea to go back into the field while she explains why she shouldn't. Thea has never had a firm identity. She's never known who she is, and that's probably because her literal identity as a child of Malcolm Merlyn was hidden for so long. So much of Oliver and Thea can be summed up with the two words "identity crisis." Even though she's had crises in the past, Thea has finally found herself in the present. She LIKES who she is. She likes what she does. And now, she doesn't fear herself and fear hurting the people around her. Thea got a glimpse into how quickly she could return to her old ways during her brief re-stint as Speedy. I have a feeling we might see her in a hood again much later in the season, but for now I am glad that she has stood up to Oliver and chosen to embrace her humanity and identity rather than the mask and hood. Meanwhile, Felicity is trying to convince Oliver that the team will never return to normal and that he needs new recruits. She and Curtis may be super-smart, but they're not superhuman. The OTA is dismantled; the new team needs more vigilantes. Oliver is resistant, of course, because what other emotion does Oliver actually have? And eventually, Felicity's sass and persistence wear Oliver down — he will begin to train a handful of vigilantes in order to become the team that Star(ling) City needs. Ultimately, with more baddies running loose this season than ever and bodies piling up, Team Arrow 6.0 (I've lost count at this point of how many different iterations this team has had, so let's just go with six) will need all the help they can get — not only to save the city, but to save themselves. Paul Blackthorne continues to be an MVP of epic proportions. All the props to him during his scenes with Willa Holland and the emotional moments with Stephen Amell. He's in a league all of his own sometimes on Arrow, and one of those times was tonight. I may be in the minority here, but I am totally okay with Felicity having a new boyfriend. We all know that eventually, Oliver and Felicity will get back together anyway. Right now, she needs to move forward with her life, just like Oliver does. That means that eventually the relationship between the two will be stronger because they will realize what it took to get back to one another. I believe in angst and all of that, and sometimes I enjoy that in relationships. But this isn't angst. This is rebuilding. It's demolishing everything that soured us (or, well, maybe just me) toward the relationship last year — the lies, the betrayal, the mistrust — and starting over with a new foundation. I have faith, not in the Arrow writers necessarily (because goodness knows there are a million ways they can screw this up), but in the story itself. It's a tale as old as time, and it will continue to be long after Oliver and Felicity are gone from our TV screens. Have faith in the story, and if you cannot, then have faith in your favorite characters. WE GET BRATVA FLASHBACKS THIS YEAR! I actually am watching the flashbacks again. It's refreshing, especially because Anatoly has returned and I really love him. Bratva flashbacks are all the fandom has been clamoring about for years now, and I'm pleased we will be ending our time spent with them here. "How'd you ditch your security detail?" "I used to ditch John Diggle." He has a point. We've got new villains this year! Tobias Church is intense, obviously, but not as intense as creepy new archer. Let's nickname him Creepy McShootsThings for now, shall we? Blake Neely's score for Creepy McShootsThings' entrance was so. dang. cool. It was an incredible twist on the Arrow theme. Speaking of incredible, this week's stunts and cinematography were off the charts. It was one of the most stylistically appealing episodes of the show in recent memory. I miss Diggle, but I love that he and Oliver find time to video chat one another. What did you all think of "Legacy"? Hit up the comments below and let me know! This was a good start, but last year's start was promising. I wish I could hang my hat on what they planned on, but so often, what they think they need and the fandom are at odds. I am with you about Olicity. If either sits pining away for the other, the character is ultimately weaker, a part of what could be a whole. Didn't like the guys hair though. That's the look of a guy who normally wears a hat (or in the DC universe, a mask). I hope he doesn't. I hope he represents normalcy and a world that isn't constantly at risk. If Felicity is a hero, and I think she is, she is going to at some point choose Overwatch (is that right?) and struggle as Oliver did to be at peace as a person with a secret. Nothing will give her insight into how Oliver made decisions than actually being faced with the same options. It should also show Oliver what normal looks like again (something he really doesn't understand), and that can leave them a place they can meet. If either of them are just waiting to be saved by the other, then both are not heroes, but victims in need of rescue. I get the idea of having archers abound in the shadows, but at some point in the modern world, it makes no sense. Let's hope this is the last one. As far as team Arrow matters, yeah, I am with you. They need to heal in different ways because the injuries are different. But more Diggle. Sooner rather than later. Great recap! See you next week! Well I like Felicity has a boyfriend too, the show is so much better without Olicity. I'm not sure if go that far, but since they have thrown it aside, I hope they build to something other than the seasonal guy boss fight. This looked good to me.